Wonders never cease. After a recent signing at Porter Square Books in Cambridge, Mass., a woman came up to comment on the passage I had read about hummingbirds and their nests. In SLOW LOVE, I write about sitting on the ground after a day of gardening, just taking things in. A hummingbird begins waggling around me; I had been reading up on them because I had found one, its neck broken, in the garden, and I had shrouded it in an ivy leaf that I pinned with a pine needle. I'm too tired to move, which is clearly what this little bird wants me to do, so instead, I rehearse what I know about hummingbirds, in her honor:"tongues thin as thread; feet poor for walking; eggs the size of peas; nests the size of walnuts, made of dandelion fluff and spider silk. I may have made that last bit up, embroidering with the silk. I want it to be true. Sometimes it is hard to leave off desiring for reality." Well, Leslie Brunetta, the woman who came up to me after the reading, has just published a book with coauthor Catherine Craig called Spider Silk: Evolution and 400 Million Years of Spinning, Waiting, Snagging & Mating. She told me that it was absolutely true that hummingbirds use spider silk in their nests! Her mother had found a couple in their lawn thirty years ago, and they were still intact, so durable is that miraculous thread. I was astonished and delighted. Just that morning, I had found and photographed an intact spider web, pearled with dew, strung across an armchair outside my study. And then, to my further surprise, a woman whose face looked familiar came up and introduced herself as a long ago friend from my summer camp days. We had once been close, but I had not seen her since 1974; I look forward to catching up. So far, because of SLOW LOVE readings, I have once again found my best friend from elementary school, several high school friends, and a couple of camp friends. What a strange and wonderful circle of life in which I am now spinning. such a beautiful photo, one can almost smell the grass and hear the birds singing. One of those perfect moments in life came when I was weeding my bed of blood-red dahlias. I looked up slowly because of a humming noise and there was a hummingbird, 10 inches from my nose. He hovered as I tried not to breath or move. It went on for a few time-stopping seconds and he veered off. I saw his eyes, his body feathers and those wings. It is the oddest thing, reminding me of that sensation on a horse when you gallop full out and feel still in the saddle... he hung in the air with a kind of stillness yet with all that motion... unforgettable. No wonder I have never found a nest if they are that small... and made of spiderwebs... how brilliant of them. My sparrows used to make nests out of my St Bernard's hair. I left it on the lawn for them to use in the spring at the end of every weekend. When I returned it would be all gone! Dominique....what wonderful encounters for you at your book reading! What blessings....! The post from lostpast is also very sweet!!! It's the tragedy and the hard times in life that really make us stronger and appreciate the bounty and the beauty of our lives. It's nice to see you reaping the benefits of pushing through the hard times. Enjoy, you've earned it. Beautiful spider web by the way. What amazing work those little scary things can do. What a beautiful photo! I wish I could stumble upon these works of art by such little creatures one of these days! One difficult (tremendous growth) summer I made friends with a spider. At the beginning of the summer he was a small wooly spider. Every night he would come out and spin his web in exactly the same location and in the morning (if I were up early enough) I would watch him wind up his web and then scurry off to spider land for the day. After about 3 weeks of these daily encounters, I began to walk over to chat with him-at first he would move away from me; after a while, it seemed that he grew accustomed to our chats. By the end of a summer of chats, my spider was a very big wooly spider. One evening as I watched him spin and we had our chat, it dawned on me that this was all I needed to do: rest, spin my web, and trust that all would be provided by God's Grace. My friend was gone the next day. The following week he did come back as if to say good-bye and then he was gone. I have never forgotten his lesson; staying true to the lesson has been a little more difficult. Had to write back to say that I just discovered (serendipity!) an article in my local paper about the topic of hummingbird nests, which the writer described as approx. 1 inch tall w/ the interior diameter the size of a quarter! 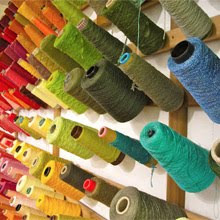 He wrote that the primary material is silk from spider webs, caterpillar tents or cocoons, and that the silk allows the nest to stretch to accommodate the growth of the newly hatched chicks. Just amazing! lOVE YOUR BLOG....I am about to start your book....I like your slow approach. I believe it is the only way to truly get in touch with our deeper selves. They call me LA CONTESSA..........but my real name is ELIZABETH KIRKPATRICK.Thrilled I found YOU I just loved YOUR letters from the EDITOR at H&G.BRAVA.I even put a sofa in my kitchen because you inspired me!I have a chaise lounge in there also!JUST PERFECT for reading your book! Until I read this, I've never thought about hummingbirds having nests! 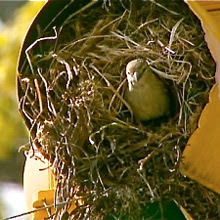 And then, today in my garden, I was planting and low and behold, I found this tiny little nest the size of a quarter! It look like it was bound with wild morning glory stem. Amazing! So precious - it still makes me smile. Thanks for that information. Have a wonderful rest of weekend. The last time I visited my local birding store the subject of hummingbird nests came up and I was informed by one of the employees that these birds prefer fresh spider webs as nesting material because they are stickier and therefore stronger & more resilient. First thing in the morning is the ideal time for them to find the webs as the spiders have been working during the night to repair & rebuild. My daughter observed one recently who was gathering up dandelion fluff as well. Wondrous creatures! 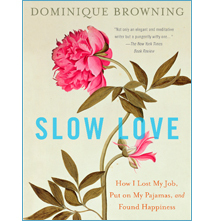 DB, I recently purchased your book Slow Love and am enjoying reading it SO very much. I sat at an outdoor cafe yesterday w a glass of wine and a cool breeze and solitude...and read it for two hours. I now discovered your blog. Keep writing. You make me smile. DB, Thank you for your book. Often I find my eyes swimming in tears upon closing a book that moved me or whose characters became my friends. Your book is one of those. It is pleasing me to find your blog and know that "Slow Love" continues. I just wanted to let you know I did a review on Slow Love on my blog, Ragland Hill Social. The Web of Connections ... how appropriate! I just finished reading throught the NYT Book REview and was thrilled to see your review of gardening books. I can't thank you enough for being "here", in cyber space and in real life. Your words in this blog, your books, your H&G columns, they all speak my language. I have added your book to my US list which simply means I can find it when I do some cross-border shopping. It sounds like the perfect summer read. I am on the hunt for the hummingbird nest as I do see hummingbirds nearby, I would guess that means a nest is nearby. PS. I am writng this in my pajamas, my favorite thing to do and one which I should not admit though I do think PJ's are underrated. Much success and hope you meet lots of long-lost friends in your book tours. Dominque, I'm so delighted to find this blog--and to find you again. I have been a fan of yours for such a long time--your letter from editor the only reason I ever subscribed to or read House Beautiful--and my wonderful assistant gave me your essay collection long ago for a long, slow summer savor. As a single mom of boys, magazine editor, and writer, I have always felt a kinship and appreciated so much of your sense of life. Now I find we're sharing an experience of slowing down the pace--how marvelous! Thanks so much. beautiful photo, post and blog. Isn't is wonderful how the circles of life spin?